I love recreating restaurant style dishes in my home and sharing them with my friends. 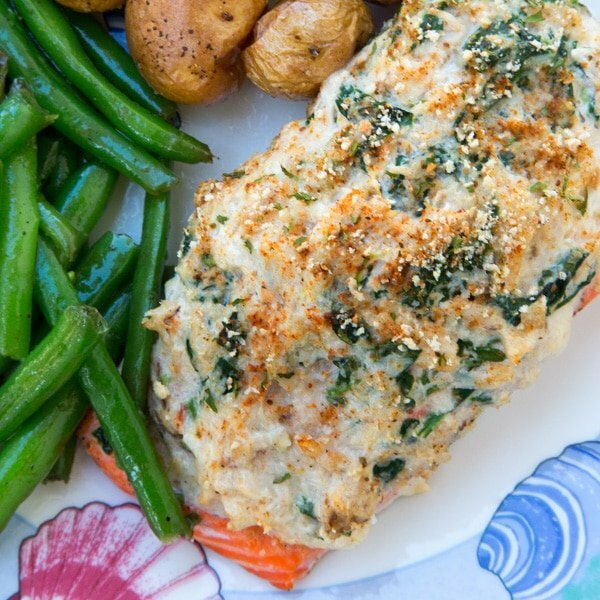 This easy to make Stuffed Salmon with Cream Cheese and Crabmeat will wow your family and friends. 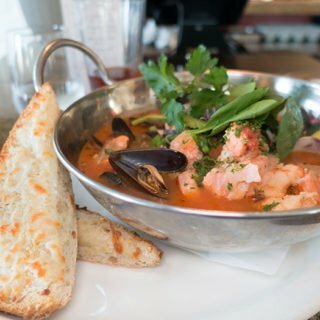 Since discovering Northwest Wild Caught Salmon earlier this year, I’ve been having fun finding different ways to prepare and enjoy this lovely fish. I was lucky enough to pick up some nice sockeye salmon at Sam’s Club. This week Stuffed Salmon was on the menu at home, and I decided to try something a little different with the stuffing using cream cheese in my stuffing mix. Lisa and I had eaten at a seafood restaurant in Madeira Beach on one of our road trips and they had a similar stuffing with a grouper we had for dinner. So I thought I’d give it a try with salmon. 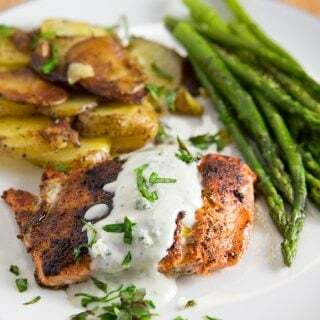 Of course there are many delicious ways to use this flavorful salmon. My Salmon Cakes and Blackened Salmon Salad are always on the menu rotation at home. When I made it the first time on Around the Kitchen Table, I used whipped cream cheese. I found that to be a mistake as it did not hold up as well as I wanted. 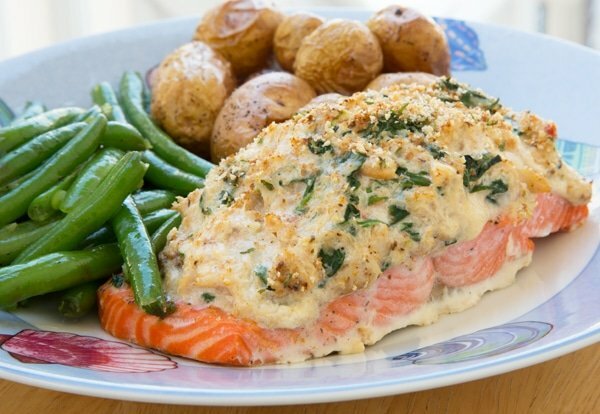 I made the Stuffed Salmon again using regular cream cheese and also added in shredded mozzarella which gave the dish a better overall appearance and taste. 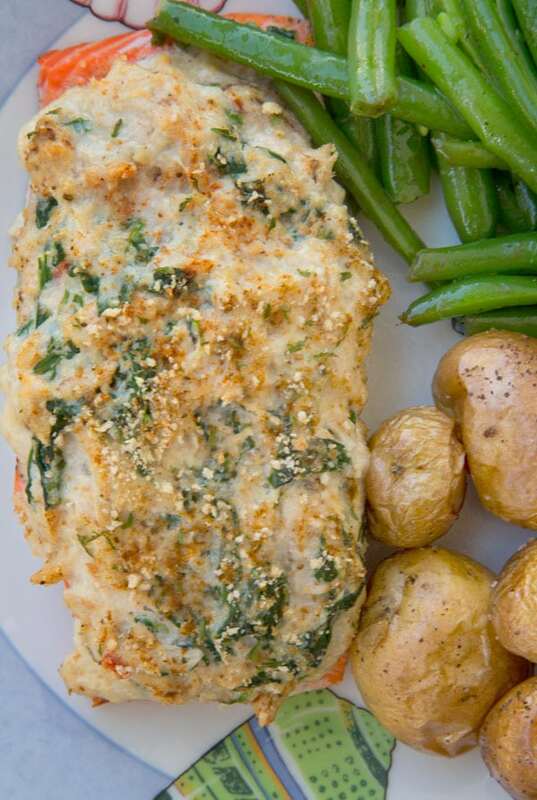 My Stuffed Salmon is a great way to turn an ordinary night into a special occasion and is great for entertaining as it can be made up ahead of time and cooked before your guests arrive. You may also try stuffing a whole side of salmon and roasting it for a buffet. It will look spectacular! in a mixing bowl add in the softened cream cheese, mayonnaise, egg and old bay seasoning. Whip together until well blended. fold in the spinach, roasted peppers, shredded mozzarella and crab meat (make sure crab meat has been well drained, squeezing out any excess water). Mix gently and if mixture is too loose you may add a little bread crumb to tighten it up. portion stuffing out and place on top of salmon fillet, then sprinkle breadcrumbs on top. Hi Dennis, I have 37 people over for thanksgiving and need another main meal like this one. In order to have enough for everyone do you think using two whole long strips of salmon ( Costco style) on top of each other for a thicker cut with your stuffing in the miidle would work ? Instead of butterflying just one? I could also butterfly both instead and present them side by side. If you’re buying two sides I would just make them separately with the crabmeat stuffing on top and cut them into 1 – 2 inch portions for service. Garnish with some chopped scallions and chopped parsley with some lemon wedges around the platter. There is no need to butterfly them or double up. Oh this looks like a great recipe to try. I love salmon, cream cheese and crab, so this is a winning combination. Will be giving this a try the next time I can get my hands on salmon and crab meat. Thank you for letting me know you enjoyed the salmon and thanks for leaving such a great rating! I absolutely love this dish when I am trying to make dinner a little more special. It’s a family favorite loved by us all which is rare with 5 kids. Everyone from my 6 yr old to my picky 16 yr old enjoy this. Thanks! I love getting comments like this Ashley, thank you so much for taking the time to try my recipe and for making it a family favorite in your home! Wow! I made this for my parents & my daughter last night. They loved it & so did I! I actually made some extra stuffing to stuff some very large portobello mushrooms.I just left out the spinach, red peppers & old bay. carefully cut the tops off & Stuffed them. Put a light coat of olive oil on them & cooked them about 3/4 of the time as I did the salmon but on the same baking dish. Thanks so much chef Dennis! It was incredible! Thanks for letting me know you tried my salmon recipe Jason! I’m very happy to hear you and your family enjoyed it. It’s one our favorites and I bet those mushrooms were delicious! Chef Dennis, I want to make the stuffing with shrimp instead of crab. I bought medium size shrimp, raw. Do I first steam and then cut the shrimp into smaller pieces for the stuffing mix? I wish to make this for Xmas Eve dinner. Thanks. Merry Christmas. Yes steam or saute the shrimp first just keep them a little on the underdone side. It would probably be best to cut them up a bit to make them easier to eat, unless they’re already bite size.
! No modifications needed. Thanks for sharing . 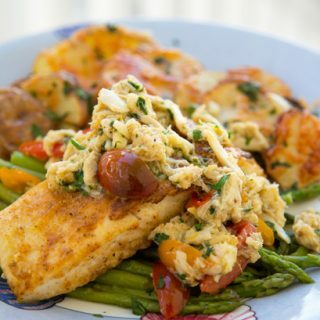 Chef, this recipe is so delicious, easy, and adaptable. 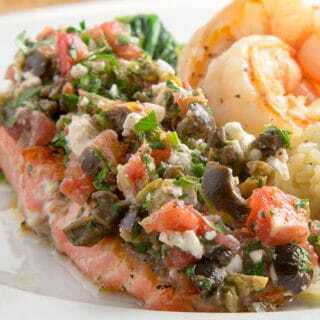 I made the dish tonight with just caught steelhead salmon and our Oregon bay shrimp, instead of dungeness crab. Worked beautifully and everyone loved it. Many thanks for sharing this keeper recipe. Thank you Debra, you’re version with the shrimp sounds delicious and I’m happy to hear you found a good use for your fresh caught salmon! Hi Chef, you mentioned wrapping it in puff pastry before. That sounds really good. Is there a recipe for that on your blog somewhere? What kind of sauce would you suggest to put on top of it? I would cook the stuffed salmon about 1/2 way done, let it cool off a bit then wrap it in the dough to finish. You just have to watch the bottom of the dough isn’t too thick, otherwise, it won’t cook all the way and the bottom will be doughy. I like a light dijon mustard sauce with a little fresh dill for this type of dish. But a beurre blanc would work too. Sounds great. Thank you chef and thank you for all the hard work that you do for this blog. I really enjoy reading it and look forward learning new skills. It’s my pleasure Ty and thanks for your support! Can the stuffing be made ahead of time? Yes Lisa, you can actually set up the whole stuffed fish ready to bake. We enjoyed this dish last night. We will definitely make it again. We added about a teaspoon or two of lemon nice to the mixture and came out great. We also naked it covered then broiled the last 5 minutes to brown the top. It came out looking gorgeous. sounds like you had fun with the recipe and made it even more delicious! I’m happy to hear you enjoyed it! Hi Dennis, this recipe sounds like exactly what I need to dazzle my family-in-law with on my first Christmas cooking for them. I was thinking of crusting mine with cashew nuts. It’s pretty easy to make and is definitely a show stopper. I’ve never used cashews before but it sounds like an interesting adaptation. Have fun with dinner and Happy Holidays! My husband and I do low carb. I used to buy the Sam’s crab stuffed salmon. 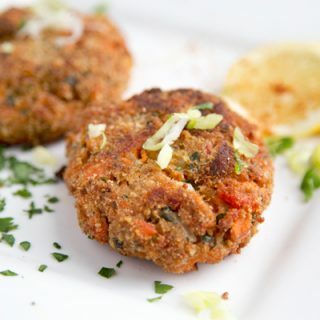 I am going to leave out the bread crumbs and this will be a great low carb recipe. Can’t wait to make it my mouth is watering just reading it!! I hope you enjoy it as much as we do Pam! I made this last night for my wife. She’s the big fish lover, me not so much. But this was really good. My internet went down so I had to make do with my memory, addled as it is. I forgot the egg and the red pepper. Still turned out great. My salmon came from Sam’s. It was pretty thick so I took the liberty to butterfly it down the middle. Nice effect. I cooked mine on a charcoal grill, with offset heat. The smoke was just right. My wife asked me to make this for our anniversary coming up in November. I’m very happy to hear you enjoyed the salmon, and feel free to add your own touch to the recipe. My wife doesn’t like red peppers so I usually leave them out for her. Have a Happy Aniversary! This was soooooooo good!! Made last night for my husband, he can’t wait for the left overs this evening! Thank you!! I love all your recipes Chef! I work in a small bar & grill in Ohio and may just make this for the boss tonight! 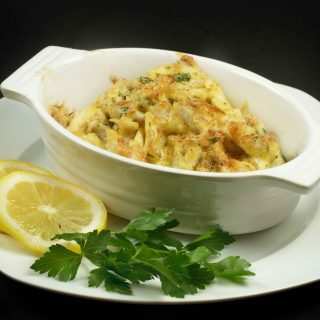 We have a wonderful supplier that brings in fresh fish and I have some crabmeat available. Yum! Thanks Brenda! I hope you enjoy it as much as we did! You’re very welcome Eric! I’m happy to hear that it was a hit. This was a big hit tonight! Defiantly will make again! No modifications really, just added a couple of fresh fresh lemon squeeze to the water when baking in oven! Thanks for the feedback Christine, I’m very happy to hear you enjoyed the salmon! Delicious…my family love it! Chef Den thank you much for the recipe.? I’ve never been a big salmon person, but I think I could change my mind with this dish, Dennis. It looks phenomenal. And yeah, I can see why the whipped cream cheese wouldn’t have held up very well. Good call to swap it out this time. I’ve never been a salmon eater at all and the northwest coho changed my mind. You can always use another fish with the stuffing instead of the salmon. I’ve never seen a recipe for stuffed salmon but this sounds delicious. thanks for stopping by and the salmon was delicious! In my restaurant days I stuffed it in the middle and use to wrap it in puff pastry. I am originally from Mobile, Alabama. I love a good crab meat stuffing. I also truly enjoy salmon and all its wonderful health benefits. YUM! you’re in crab meat heaven in Mobile! I have a hard time finding fresh crabmeat in Orlando which perplexes me since were so close to the gulf and atlantic! Yum! I love salmon. Thanks for sharing your wonderful recipe! you’re welcome Mary Frances, thanks for stopping by! sounds like it was dee-licious! Thanks for trying my recipe and making it your own!